Waldkirch, 2015-11-20 – SICK AG has emerged victorious in the “Consumer Goods/Electronics” category of the Corporate Health Award 2015. The sensor specialist rose to first place in recognition of its workplace health management system, beating out 380 companies – a record number – competing in ten categories. The Corporate Health Award was launched in 2009 as a means of commending best-practice workplace health management systems, and was given to twelve companies in eight industry categories and four special categories. SICK has been a regular participant since 2009, receiving a special “Demographics” prize in that very first year as recognition of its exemplary commitment to this subject. The award scrutinizes and evaluates the structure, strategy, and performance of workplace health management systems. SICK has consistently used the feedback from the audit that forms part of the award in order to further develop its own system, enabling its result to continually rise – most recently to 98 out of a possible 100 points. The auditors highlighted the system underpinning SICK's workplace health management strategy, plus its structure and what it offers, as unique features, stating that: “The workplace health management system is firmly integrated into the company's management philosophy and corporate goals, and receives direct support from the topmost level of management.” The systematic process and standardized optimization loop used throughout the workplace health management system also received praise. Together with the company's medical service and occupational safety team, the workplace health and social management system at SICK aims to maintain and promote health and well-being among all its employees as they go about their work. To this end, the company systematically develops concepts and structures into which all its operational processes are integrated. These include providing protection for people in the workplace, creating health-promoting working conditions, occupational activities, and organizational measures, plus disseminating knowledge so that employees can feel in charge of their own health and deal with the tasks that their working day presents. The Corporate Health Award is the leading quality initiative for workplace health management systems within German-speaking regions. 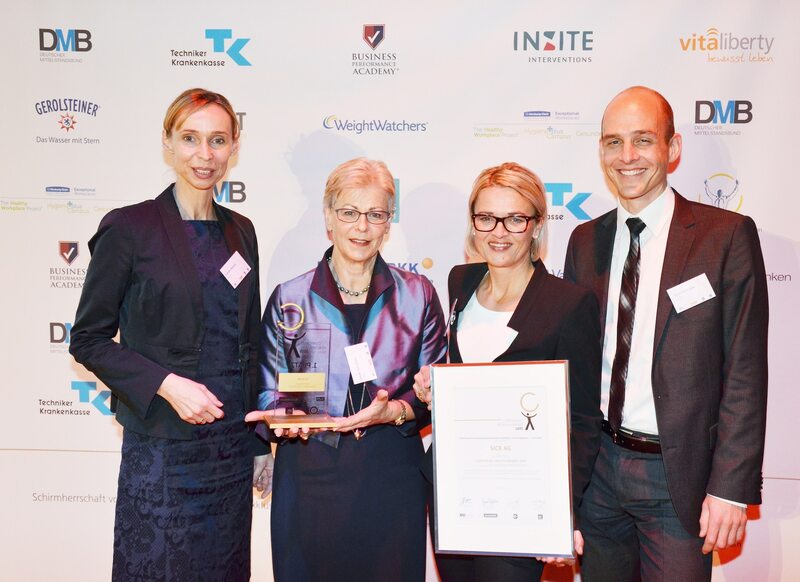 The quality model for workplace health management – a joint initiative between EuPD Research, TÜV SÜD Life Service, and the newspaper Handelsblatt – was developed in 2008 and forms the basis of the award. It brings together a range of workplace health management systems on the basis of valid quality criteria, making it possible to identify particular areas of strength and potential for optimization. The initiative operates under the auspices of the German Federal Ministry of Health. SICK is one of the world's leading manufacturers of sensors and sensor solutions for industrial applications. Founded in 1946 by Dr. Erwin Sick, the company is headquartered in the German town of Waldkirch, in the Breisgau region near the city of Freiburg. It is a technology and market leader, maintaining a global presence with more than 50 subsidiaries and equity investments as well as numerous agencies. In the 2014 fiscal year, SICK had around 7,000 employees worldwide and generated Group revenues of €1,099.8 million. Renate Sick-Glaser (second from left), one of founder Dr. Erwin Sick's two daughters, was there to accept the Corporate Health Award in the “Consumer Goods/Electronics” category. As Managing Director, she is highly committed to the issue of health in the workplace. At the award ceremony there were also Cornelia Reinecke , Heike Faller and Stefan Hörmann (from left ).